Laparoscopic procedures have greatly improved over the last few years with advances in both anesthetic and surgical techniques. It has revolutionized the surgical field since its introduction in 1950 with its advantages of decreased morbidity and early recovery., Although a large number of beneficial effects have been attributed to laparoscopy,, they are known to induce specific and potentially deleterious pathophysiological changes to various systems of the body with a wide variety of hemodynamic changes. It is critical for both the surgeon and the anesthesiologist to understand the pathophysiological consequences of laparoscopy  and to work collaboratively to achieve optimal outcome. The aim of this article is to provide a comprehensive review on the various physiological changes, benefits as well as complications, perioperative anesthetic considerations, and the various pharmacological agents used to attenuate the hemodynamic changes associated with laparoscopy. A systematic literature search was done using electronic databases including PubMed and Google Scholar with the help of keywords such as “laparoscopy,” “laparoscopic surgery,” “anaesthesia for laparoscopy,” “hemodynamics in laparoscopy,” and “organ system involvement in laparoscopy.” Searches were conducted by the first author. A total of 93 papers between January 1985 and December 2016 were retrieved which included about 45 randomized control trials, 23 review articles, 5 case reports, and 4 meta-analyses. References were cross-checked and relevant literature was included. An extensive review on the effects of laparoscopic cholecystectomy in comparison to open procedure was done on various aspects of lung function, namely, spirometric values, arterial blood gases, and respiratory muscle performance. The spirometric variables in the laparoscopy group, namely, forced vital capacity (FVC), forced expiratory volume at 1 s (FeV1), and FEF 25%-75% Forced expiratory flow 25%-75%, were well preserved after 24 h of operation with no major change compared to their preoperative values as against those of open procedure where the values had reduced by almost 50% of the original values. Arterial blood gas and partial pressure of oxygen at 24–48 h after surgical treatment showed reduction, which were significantly greater in open group compared with laparoscopy. Thus, the authors concluded laparoscopic cholecystectomy to be associated with less postoperative derangement of lung function compared to open procedure. A meta-analysis of laparoscopy versus open colorectal surgeries, which included four randomized control trials and six clinical control trials comprising 1510 patients, was published in 2016. Duration of postoperative hospital stay, time to first bowel movement, total postoperative complication rate, readmission, and mortality were significantly reduced in the laparoscopic surgery group  [Table 1]. Trendelenburg or anti-Trendelenburg positioning of the patient. The pneumoperitoneum increases the abdominal pressure, elevates the diaphragm, and can compress both small and big blood vessels. The vena caval compression and the decreased venous return due to pooling of blood in the legs lead to a decrease in cardiac output by as much as 50%, especially in patients with reverse Trendelenburg or with a low cardiovascular reserve. The diaphragm elevation also raises the intrathoracic pressure with a reduction in cardiac output. The low cardiac output can be compensated in a healthy patient by an increase in the heart rate (HR) and arterial pressure obtaining a stable hemodynamic status. Various mechanical and neurohumoral factors play a role. 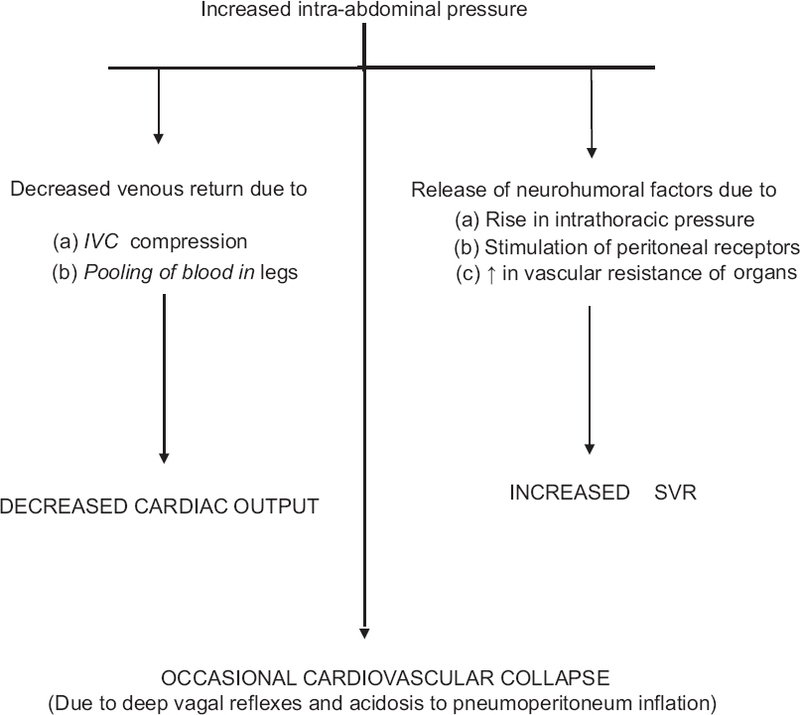 Changes in the intrathoracic and transmural right atrial pressure and mechanical stimulation of peritoneal receptors cause release of vasopressin, thus increasing the force and arterial pressures. 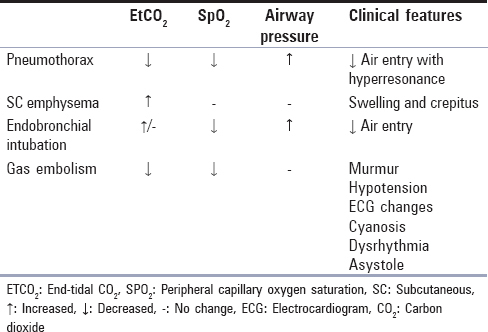 Cardiovascular collapse and asystole on induction of pneumoperitoneum have been described and attributed to deep vagal reflexes., If pulmonary ventilation is not enough to eliminate the CO2 absorbed from pneumoperitoneum, hypercapnia appears and the resultant acidosis can depress myocardial function and predispose to arrhythmias  [Table 2]. The increase in IAP and elevation of diaphragm due to pneumoperitoneum causes decrease in pulmonary compliance by 30%–50% in healthy individuals., Functional residual capacity decreases with gradual development of atelectasis and hypoxemia. Partial pressure of CO2 increases in the blood because of absorption of blood from the peritoneal cavity , as well as due to impairment of pulmonary ventilation and perfusion by abdominal distension, patient position (Trendelenburg), and volume-controlled ventilation. 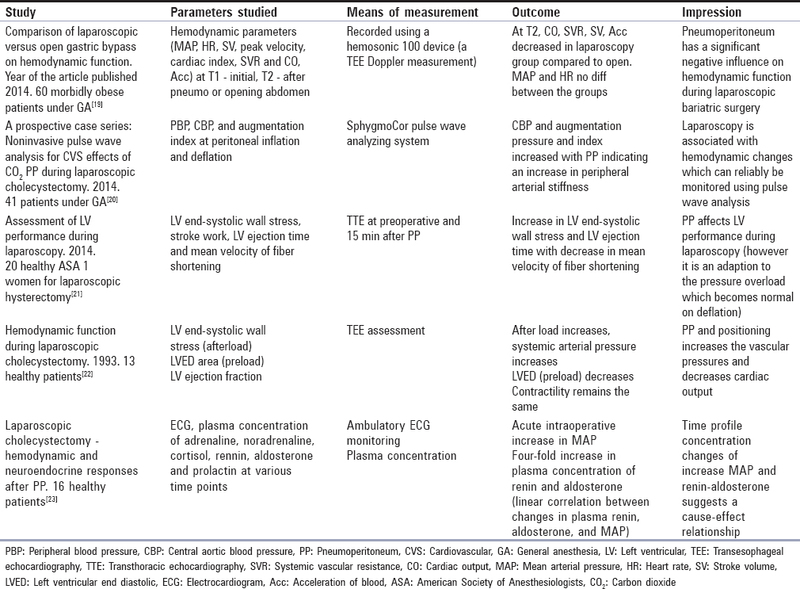 However, limiting IAP to 14 mmHg with the patient in a 10°–20° head-down or head-up position does not significantly modify physiological dead space or shunt and is found to be well tolerated in patients without cardiovascular disease  [Table 3]. Increase in IAP and head-up position aggravates femoral venous stasis. This causes an increase in thrombotic events. Increase in IAP perils the splanchnic circulation with a decrease in the blood flow to major abdominal organs. Microcirculatory changes in abdominal organs during CO2 pneumoperitoneum were studied in 18 patients undergoing routine laparoscopy. Organ blood flow was measured using a custom-made laser Doppler flow probe at an IAP of 0, 10, and 15 mmHg. It was found that IAP elevation from 10 to 15 mmHg significantly decreased the blood flow in the stomach, jejunum, duodenum, colon, and liver. Splanchnic blood flow decreased with operative time at a constant intra-arterial pressure,, thus stressing the fact that laparoscopy surgery with CO2 pneumoperitoneum should be performed at pressure of 12–14 mmHg or lower to avoid microcirculatory disturbances. It has been reported that CO2 insufflation can produce adverse cerebrovascular effects, although this has not been extensively studied. Cerebral blood flow increases during pneumoperitoneum in head-down position due to the rise in arterial CO2 pressures. This increase in cerebral blood flow which is usually tolerated could be dangerous in patients with cerebral disease, decreased intracranial compliance, or impaired cerebral physiology. The choice of anesthetic agents also plays a role in minimizing the cerebrovascular responses to laparoscopy. The aim of anesthesia in laparoscopy surgery should include selection of proper anesthetic agent, maintaining normal-to-mild hypercarbia, good oxygenation status, and hemodynamic stability. Any hypotension, hypoxia, and hypercarbia should be avoided. Monitoring of brain tissue oxygenation is a useful tool in clinical setting, especially in high-risk patients providing us the ability to detect any alteration in cerebral oxygenation/perfusion, thus enabling us to intervene at its earliest. Preoperative assessment for laparoscopy surgery requires special attention to cardiovascular and respiratory systems (because of potential effects of pneumoperitoneum and positioning), especially in obese individuals and those with a low cardiopulmonary reserve. Relative contraindication to laparoscopy should be considered (severe ischemia, valvular heart disease, raised intracranial pressure, and hypovolemia). Cardiac patients with severe left ventricular dysfunction may require intense hemodynamic monitoring. In such patients, gasless laparoscopy or laparotomy may be considered. Premedication for laparoscopic surgery involves H2 blockers or proton-pump inhibitors (especially in patients with increased risk of aspiration) and benzodiazepines (if patient is particularly anxious). Premedication with oral ondansetron was found to significantly reduce the incidence of postoperative nausea vomiting (PONV), especially in gynecological laparoscopy. Anticholinergics are not advocated routinely for laparoscopy. A prospective double-blind randomized study was conducted by Hong in 2006 to evaluate the effects of routine premedication with H2 blockers and prokinetics in patients undergoing ambulatory laparoscopy procedure. Fifteen minutes before induction of anesthesia, one group received 50 mg ranitidine and 10 mg metoclopramide intravenous (IV) and the control group received the same volume of normal saline. When a 14 G nasogastric tube was inserted to aspirate the gastric contents, the mean pH value of the gastric fluid was lower in the control group and the mean aspirated volumes were also higher in the control group, thus revealing those who received ranitidine metoclopramide for prophylaxis before induction to be at lower risk of aspiration pneumonitis in ambulatory laparoscopic procedures. Although anticholinergics are not routinely used, a routine prophylaxis might be helpful in prevention of sinus bradycardia during laparoscopic surgeries. A study done by Aghamohammadi et al. to evaluate the efficacy of atropine sulfate for prevention of bradyarrhythmia during laparoscopic surgery showed a significant decreasing trend in HRs during the operation in patients without atropine prophylaxis. Use of other anticholinergics such as scopolamine patch in patients undergoing gynecological laparoscopy had a significant less incidence of nausea and vomiting during the first 24 h after the surgery. However, another study with preemptive glycopyrrolate 0.2 mg IV given before induction did not significantly reduce the incidence of intraoperative bradycardia compared to the control group (P = 0.4). However, the drug with its antispasmodic properties given before induction was highly effective as a method of improving the quality of recovery and pain  (due to tubal spasm following sterilization) after day care laparoscopic sterilization procedures. Dexmedetomidine, a newer and an upcoming drug, an alpha-2 agonist, acts by inhibiting the release of catecholamines and vasopressin. It is known to provide excellent sedation and analgesia with minimal respiratory depression., The drug as an infusion ranging from 0.2 to 10 μg/kg/h has been used in a large number of studies involving laparoscopy as an anesthetic adjuvant for attenuating the hemodynamic stress response. However, studies with higher doses had more incidence of bradycardia and hypotension. Thus, a loading dose of 0.5–1 μg/kg over 10–15 min followed by a continuous infusion of 0.2–0.5 μg/kg/h was effective with minimal side effects. Dexmedetomidine was also found to reduce the requirements of other anesthetic agents and opioids. Beta-blockers as esmolol, an ultra-short-acting cardioselective beta-1 receptor antagonist has been routinely used in a loading dose of 1 mg/kg over 5 min followed by 0.5 mg/kg/h in attenuation of stress response to laparoscopy. The effect is mediated by blockade of peripheral beta-adrenergic receptors. The other added benefits of esmolol are opioid-sparing effect and a higher urine output (protection against pneumoperitoneum) during intra- and immediate postoperative period in laparoscopic surgeries. Clonidine, an alpha-2 agonist similar to dexmedetomidine, is a potent antihypertensive drug that suppresses Renin angiotension aldosterone system (RAAS). Clonidine administered in a dose of 4.5 μg/kg was found to decrease mean arterial pressure (MAP) and HR significantly during and after pneumoperitoneum  as well as decrease the requirement of isoflurane who were premedicated with clonidine. The plasma rennin levels were also significantly lower in patients treated with clonidine. Thus, clonidine may protect the kidneys from ischemia caused by increased IAP and activated neurohumoral cascade during pneumoperitoneum. Administration of magnesium sulfate was found to attenuate the increase in arterial pressure during CO2 pneumoperitoneum. Studies have suggested that magnesium can inhibit catecholamine and vasopressin release in vitro and in vivo., In a study done by Jee et al., MgSO4 given in a dose of 50 mg/kg was found to significantly attenuate the arterial pressure during laparoscopy. Pregabalin given as oral premedication was evaluated for hemodynamic stability during pneumoperitoneum. Pregabalin, an antiepileptic drug, is effective in controlling neuropathic component of acute nociceptive pain of surgery by inhibiting voltage-gated calcium channels. The hemodynamic stability provided by oral premedication might enable laparoscopic surgery in obese, hypertensive, and cardiac compromised patients with no risk of postoperative respiratory depression. The use of NTG in laparoscopic procedures has multiple benefits. The drug as an infusion in the dose of 0.5 μg/kg/min was found to be effective at preventing changes in hemodynamic parameters  and IOP induced by CO2 insufflation during laparoscopic cholecystectomy. There was a statistically significant difference in MAP, IOP, and ETCO2 between NTG and saline groups. Furthermore, spasm of Sphincter of Oddi More Details commonly encountered during laparoscopic cholecystectomy has successfully been treated with IV nitroglycerin. In an animal study of male rats, when animals were pretreated with NTG, the adverse effects of pneumoperitoneum on urine flow rate, urine sodium excretion, GFR, and renal plasma flow were substantially improved, suggesting that adverse effects of pneumoperitoneum are probably related to the interference with the nitric oxide system and could partially be ameliorated by pretreatment with NTG. Appropriate and standard monitoring techniques must be used to ensure optimal anesthesia care during laparoscopy  Hence, electrocardiogram, noninvasive blood pressure, airway pressure monitor, pulse oximeter, ETCO2 monitor, and temperature probe are routinely used. Morbidly obese and patients with poor cardiovascular/respiratory reserve may require additional monitoring in terms of invasive blood pressure  and urine output. Airway pressure monitoring is crucial in laparoscopic procedure as a high airway pressure alarm can aid in detection of excessive elevation in IAP. Additional nerve stimulation ensures adequate muscle paralysis which decreases the IAP necessary for abdominal distension. Recovery following a laparoscopic surgery is faster than open procedure mainly due to better preservation of postoperative pulmonary function (FeV1 and FVC), less pain due to reduced tissue trauma of incision, decreased postoperative ileus, and quicker mobilization, thus leading to overall shorter hospital stay and cost. Shoulder tip pain, pain at site, and PONV are few of the postoperative concerns. Complete evacuation of CO2 following the procedure helps minimize the incidence of shoulder tip pain. Preemptive use of serotonin antagonists with single dose of dexamethasone has greatly found to decrease PONV. A multimodal approach to pain management following laparoscopy  has been described to be effective with routine use of NSAIDS or COX 2 inhibitors, local anesthetics in the form of incisional and intraperitoneal instillation (reduces neurogenic local inflammation at the trauma site), opioids, and steroids. The addition of gabapentin, clonidine, and NMDA receptor antagonists may also have additional analgesic control. GA versus regional anesthesia for laparoscopic surgeries has its own advantages and disadvantages with evidence in the literature , [Table 4]. Although the use of regional anesthesia in terms of spinal/combined epidural spinal has been emerging recently as a sole technique with its benefits,,, it still continues to remain a controversial decision when it comes to laparoscopic surgical procedure., A meta-analysis of RCTs which included relevant articles from January 2000 to December 2016 was carried out to compare spinal anesthesia (SA) versus GA for laparoscopic cholecystectomy. Primary outcome (postoperative pain scores) and secondary outcome (operating time and postoperative complications) were pooled. Seven hundred and twelve patients were treated, 352 in SA group and 360 in GA group. Laparoscopic cholecystectomy under SA was superior to GA in postoperative pain within 12 h in terms of VAS and postoperative complications (PONV and overall morbidity). However, GA group was superior to SA group in postoperative urinary retention. There were no significant differences in the operating time. SA as a sole anesthetic technique was thus feasible and found to be safe for elective laparoscopic cholecystectomy. Like any other medical procedure, laparoscopy is associated with a set of complications, incidence of which varies significantly depending on the training and experience of the surgeon and the type and complexity of the procedure. The anesthesiologist has to have a knowledge of these to deal with when these potential situations arise [Table 5]. Insufflations of CO2 can occur in the intravascular, subcutaneous tissue, preperitoneal space, omentum, mesentery, or retroperitoneum due to the misplacement of the Veress needle. Insufflations of CO2 into blood vessel or entrainment of gas into open vessel by venture effect leads to gas embolism., It may manifest with mild-to-severe cardiovascular changes based on the amount of gas entrained into the vascular compartment. Treatment involves resuscitative measures along with attempts to aspirate the gas via central venous catheters. Needle placement above the abdominal fascia or CO2 leakage around trocar ports may lead to extravasation of gas into the subcutaneous plane leading to subcutaneous emphysema. It is characterized by crepitus over the abdominal and chest wall with increase in ETCO2 and airway pressures. Pneumothorax under laparoscopy can occur due to an accidental tear in the visceral peritoneum by the Trocar. A congenital defect in the diaphragm (patent pleuroperitoneal canal) or a spontaneous rupture of pre existing emphysematous bullae may also lead to pnemothorax under laparoscopy. It manifests as increased airway pressures, decrease in oxygen saturation, and significant reduction in cardiac output and blood pressure. Trocar-associated injury of blood vessels, namely, aorta, iliac vessels, inferior vena cava, hepatic artery, and gastrointestinal injuries such as small intestine, colon, duodenum, stomach, and spleen are not uncommon with laparoscopic procedures. Bajwa SJ, Kulshrestha A. Anaesthesia for laparoscopic surgery: General vs. regional anaesthesia. J Minim Access Surg 2016;12:4-9. Kim YW, Baik YH, Yun YH, Nam BH, Kim DH, Choi IJ, et al. Improved quality of life outcomes after laparoscopy-assisted distal gastrectomy for early gastric cancer: Results of a prospective randomized clinical trial. Ann Surg 2008;248:721-7. Woodham BL, Cox MR, Eslick GD. Evidence to support the use of laparoscopic over open appendicectomy for obese individuals: A meta-analysis. Surg Endosc 2012;26:2566-70. Katkhouda N, Mason RJ, Towfigh S, Gevorgyan A, Essani R. Laparoscopic versus open appendectomy: A prospective randomized double-blind study. Ann Surg 2005;242:439-48. Cunningham AJ. Anesthetic implications of laparoscopic surgery. Yale J Biol Med 1998;71:551-78. Mais V, Ajossa S, Guerriero S, Mascia M, Solla E, Melis GB, et al. Laparoscopic versus abdominal myomectomy: A prospective, randomized trial to evaluate benefits in early outcome. Am J Obstet Gynecol 1996;174:654-8. Bablekos GD, Michaelides SA, Analitis A, Charalabopoulos KA. Effects of laparoscopic cholecystectomy on lung function: A systematic review. World J Gastroenterol 2014;20:17603-17. Zhao JH, Sun JX, Huang XZ, Gao P, Chen XW, Song YX, et al. Meta-analysis of the laparoscopic versus open colorectal surgery within fast track surgery. Int J Colorectal Dis 2016;31:613-22. McLaughlin JG, Scheeres DE, Dean RJ, Bonnell BW. The adverse hemodynamic effects of laparoscopic cholecystectomy. Surg Endosc 1995;9:121-4. Joris JL, Chiche JD, Canivet JL, Jacquet NJ, Legros JJ, Lamy ML, et al. Hemodynamic changes induced by laparoscopy and their endocrine correlates: Effects of clonidine. J Am Coll Cardiol 1998;32:1389-96. Nguyen NT, Ho HS, Fleming NW, Moore P, Lee SJ, Goldman CD, et al. Cardiac function during laparoscopic vs. open gastric bypass. Surg Endosc 2002;16:78-83. Lew JK, Gin T, Oh TE. Anaesthetic problems during laparoscopic cholecystectomy. Anaesth Intensive Care 1992;20:91-2. Joris JL, Hamoir EE, Hartstein GM, Meurisse MR, Hubert BM, Charlier CJ, et al. Hemodynamic changes and catecholamine release during laparoscopic adrenalectomy for pheochromocytoma. Anesth Analg 1999;88:16-21. Sprung J, Abdelmalak B, Schoenwald PK. Recurrent complete heart block in a healthy patient during laparoscopic electrocauterization of the fallopian tube. Anesthesiology 1998;88:1401-3. Brantley JC 3rd, Riley PM. Cardiovascular collapse during laparoscopy: A report of two cases. Am J Obstet Gynecol 1988;159:735-7. Gaszynski T, Szewczyk T. The influence of laparoscopic vs. open gastric bypass on hemodynamic function in morbidly obese patients during general anesthesia. Wideochirurgia Inne Tech Maloinwazyjne Videosurgery Miniinvasive Tech. 2014 Mar;9:83–8. Sárkány P, Lengyel S, Nemes R, Orosz L, Páll D, Molnár C, et al. Non-invasive pulse wave analysis for monitoring the cardiovascular effects of CO2 pneumoperitoneum during laparoscopic cholecystectomy – A prospective case-series study. BMC Anesthesiol 2014;14:98. Russo A, Di Stasio E, Bevilacqua F, Marana E. Assessment of left ventricular performance during laparoscopy. Eur Rev Med Pharmacol Sci 2014;18:2378-82. Cunningham AJ, Schlanger M. Intraoperative hypoxemia complicating laparoscopic cholecystectomy in a patient with sickle hemoglobinopathy. Anesth Analg 1992;75:838-43. O'Leary E, Hubbard K, Tormey W, Cunningham AJ. Laparoscopic cholecystectomy: Haemodynamic and neuroendocrine responses after pneumoperitoneum and changes in position. Br J Anaesth 1996;76:640-4. Hirvonen EA, Nuutinen LS, Kauko M. Ventilatory effects, blood gas changes, and oxygen consumption during laparoscopic hysterectomy. Anesth Analg 1995;80:961-6. Rauh R, Hemmerling TM, Rist M, Jacobi KE. 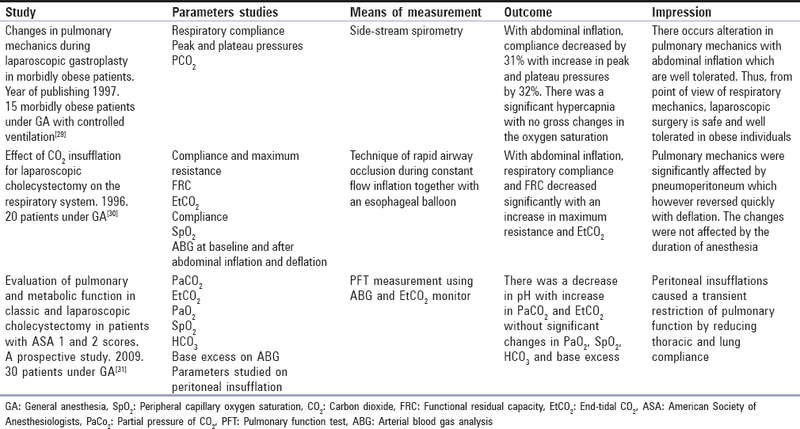 Influence of pneumoperitoneum and patient positioning on respiratory system compliance. J Clin Anesth 2001;13:361-5. Wahba RW, Béïque F, Kleiman SJ. Cardiopulmonary function and laparoscopic cholecystectomy. Can J Anaesth 1995;42:51-63. O'Malley C, Cunningham AJ. Physiologic changes during laparoscopy. Anesthesiol Clin N Am 2001;19:1-19. Hatipoglu S, Akbulut S, Hatipoglu F, Abdullayev R. Effect of laparoscopic abdominal surgery on splanchnic circulation: Historical developments. World J Gastroenterol 2014;20:18165-76. Dumont L, Mattys M, Mardirosoff C, Vervloesem N, Allé JL, Massaut J, et al. Changes in pulmonary mechanics during laparoscopic gastroplasty in morbidly obese patients. Acta Anaesthesiol Scand 1997;41:408-13. Pelosi P, Foti G, Cereda M, Vicardi P, Gattinoni L. Effects of carbon dioxide insufflation for laparoscopic cholecystectomy on the respiratory system. Anaesthesia 1996;51:744-9. Stefanović B, Stefanović B, Popović N, Mijatovć S, Skodrić V, Pavlović A, et al. Evaluation of pulmonary and metabolic function in classic and laparoscopic cholecystectomy in patients with ASA I and ASA II scores. Acta Chir Iugosl 2009;56:73-80. McDougall EM, Monk TG, Wolf JS Jr., Hicks M, Clayman RV, Gardner S, et al. The effect of prolonged pneumoperitoneum on renal function in an animal model. J Am Coll Surg 1996;182:317-28. Chang DT, Kirsch AJ, Sawczuk IS. Oliguria during laparoscopic surgery. J Endourol 1994;8:349-52. Richards WO, Scovill W, Shin B, Reed W. Acute renal failure associated with increased intra-abdominal pressure. Ann Surg 1983;197:183-7. Schilling MK, Redaelli C, Krähenbühl L, Signer C, Büchler MW. Splanchnic microcirculatory changes during CO2 laparoscopy. J Am Coll Surg 1997;184:378-82. Hashikura Y, Kawasaki S, Munakata Y, Hashimoto S, Hayashi K, Makuuchi M, et al. Effects of peritoneal insufflation on hepatic and renal blood flow. Surg Endosc 1994;8:759-61. Knolmayer TJ, Bowyer MW, Egan JC, Asbun HJ. The effects of pneumoperitoneum on gastric blood flow and traditional hemodynamic measurements. Surg Endosc 1998;12:115-8. Lee JR, Lee PB, Do SH, Jeon YT, Lee JM, Hwang JY, et al. The effect of gynaecological laparoscopic surgery on cerebral oxygenation. J Int Med Res 2006;34:531-6. Moka E. Cerebral oximetry and laparoscopic surgery. J Minim Access Surg 2006;2:47-8. Papadimitriou LS, Livanios SH, Moka EG, Demesticha TD, Papadimitriou JD. Cerebral blood flow velocity alterations, under two different carbon dioxide management strategies, during sevoflurane anesthesia in gynecological laparoscopic surgery. Neurol Res 2003;25:361-9. Monson JR, Darzi A, Carey PD, Guillou PJ. Prospective evaluation of laparoscopic-assisted colectomy in an unselected group of patients. Lancet 1992;340:831-3. Wittgen CM, Andrus CH, Fitzgerald SD, Baudendistel LJ, Dahms TE, Kaminski DL, et al. Analysis of the hemodynamic and ventilatory effects of laparoscopic cholecystectomy. Arch Surg 1991;126:997-1000. Duffy BL. Regurgitation during pelvic laparoscopy. Br J Anaesth 1979;51:1089-90. Malins AF, Field JM, Nesling PM, Cooper GM. Nausea and vomiting after gynaecological laparoscopy: Comparison of premedication with oral ondansetron, metoclopramide and placebo. Br J Anaesth 1994;72:231-3. Hong JY. Effects of metoclopramide and ranitidine on preoperative gastric contents in day-case surgery. Yonsei Med J 2006;47:315-8. Aghamohammadi H, Mehrabi S, Mohammad Ali Beigi F. Prevention of bradycardia by atropine sulfate during urological laparoscopic surgery: A randomized controlled trial. Urol J 2009;6:92-5. Einarsson JI, Audbergsson BO, Thorsteinsson A. Scopolamine for prevention of postoperative nausea in gynecologic laparoscopy, a randomized trial. J Minim Invasive Gynecol 2008;15:26-31. Ambrose C, Buggy D, Farragher R, Troy A, McNulty C, Carey M, et al. Pre-emptive glycopyrrolate 0.2 mg and bradycardia during gynaecological laparoscopy with mivacurium. Eur J Anaesthesiol 1998;15:710-3. Guard BC, Wiltshire SJ. The effect of glycopyrrolate on postoperative pain and analgesic requirements following laparoscopic sterilisation. Anaesthesia 1996;51:1173-5. Marco AP, Yeo CJ, Rock P. Anesthesia for a patient undergoing laparoscopic cholecystectomy. Anesthesiology 1990;73:1268-70. Wilmore DW, Kehlet H. Management of patients in fast track surgery. BMJ 2001;322:473-6. Tramèr M, Moore A, McQuay H. Omitting nitrous oxide in general anaesthesia: Meta-analysis of intraoperative awareness and postoperative emesis in randomized controlled trials. Br J Anaesth 1996;76:186-93. Yang H, Choi PT, McChesney J, Buckley N. Induction with sevoflurane-remifentanil is comparable to propofol-fentanyl-rocuronium in PONV after laparoscopic surgery. Can J Anaesth 2004;51:660-7. Song D, White PF. Remifentanil as an adjuvant during desflurane anesthesia facilitates early recovery after ambulatory surgery. J Clin Anesth 1999;11:364-7. Song D, Whitten CW, White PF. Remifentanil infusion facilitates early recovery for obese outpatients undergoing laparoscopic cholecystectomy. Anesth Analg 2000;90:1111-3. Beleña JM, Núñez M, Vidal A, Anta D. Randomized double-blind comparison of remifentanil and alfentanil in patients undergoing laparoscopic cholecystectomy using total intravenous anesthesia. J Anaesthesiol Clin Pharmacol 2016;32:487-91. Maltby JR, Beriault MT, Watson NC, Liepert D, Fick GH. The LMA-ProSeal is an effective alternative to tracheal intubation for laparoscopic cholecystectomy. Can J Anaesth 2002;49:857-62. Maltby JR, Beriault MT, Watson NC, Liepert DJ, Fick GH. LMA-classic and LMA-ProSeal are effective alternatives to endotracheal intubation for gynecologic laparoscopy. Can J Anaesth 2003;50:71-7. Beleña JM, Ochoa EJ, Núñez M, Gilsanz C, Vidal A. Role of laryngeal mask airway in laparoscopic cholecystectomy. World J Gastrointest Surg 2015;7:319-25. Salihoglu Z, Demiroluk S, Dikmen Y. Respiratory mechanics in morbid obese patients with chronic obstructive pulmonary disease and hypertension during pneumoperitoneum. Eur J Anaesthesiol 2003;20:658-61. Koivusalo AM, Scheinin M, Tikkanen I, Yli-Suomu T, Ristkari S, Laakso J, et al. Effects of esmolol on haemodynamic response to CO2 pneumoperitoneum for laparoscopic surgery. Acta Anaesthesiol Scand 1998;42:510-7. Jee D, Lee D, Yun S, Lee C. Magnesium sulphate attenuates arterial pressure increase during laparoscopic cholecystectomy. Br J Anaesth 2009;103:484-9. Srivastava VK, Nagle V, Agrawal S, Kumar D, Verma A, Kedia S, et al. Comparative evaluation of dexmedetomidine and esmolol on hemodynamic responses during laparoscopic cholecystectomy. J Clin Diagn Res 2015;9:UC01-5. Talke P, Chen R, Thomas B, Aggarwall A, Gottlieb A, Thorborg P, et al. The hemodynamic and adrenergic effects of perioperative dexmedetomidine infusion after vascular surgery. Anesth Analg 2000;90:834-9. Collard V, Mistraletti G, Taqi A, Asenjo JF, Feldman LS, Fried GM, et al. Intraoperative esmolol infusion in the absence of opioids spares postoperative fentanyl in patients undergoing ambulatory laparoscopic cholecystectomy. Anesth Analg 2007;105:1255-62. Coloma M, Chiu JW, White PF, Armbruster SC. The use of esmolol as an alternative to remifentanil during desflurane anesthesia for fast-track outpatient gynecologic laparoscopic surgery. Anesth Analg 2001;92:352-7. Kalra NK, Verma A, Agarwal A, Pandey H. Comparative study of intravenously administered clonidine and magnesium sulfate on hemodynamic responses during laparoscopic cholecystectomy. J Anaesthesiol Clin Pharmacol 2011;27:344-8. Inomata S, Kihara S, Yaguchi Y, Baba Y, Kohda Y, Toyooka H, et al. Reduction in standard MAC and MAC for intubation after clonidine premedication in children. Br J Anaesth 2000;85:700-4. Laisalmi M, Koivusalo AM, Valta P, Tikkanen I, Lindgren L. Clonidine provides opioid-sparing effect, stable hemodynamics, and renal integrity during laparoscopic cholecystectomy. Surg Endosc 2001;15:1331-5. Thwaites CL, Yen LM, Cordon SM, Thwaites GE, Loan HT, Thuy TT, et al. Effect of magnesium sulphate on urinary catecholamine excretion in severe tetanus. Anaesthesia 2008;63:719-25. Moon HS, Lee SK, Choi YS, In CB, Choi EJ. The effect of nitroglycerin on hemodynamic changes during laparoscopic low anterior resection. Korean J Anesthesiol 2011;61:388-93. Toyoyama H, Kariya N, Hase I, Toyoda Y. The use of intravenous nitroglycerin in a case of spasm of the sphincter of Oddi during laparoscopic cholecystectomy. Anesthesiology 2001;94:708-9. Bishara B, Karram T, Khatib S, Ramadan R, Schwartz H, Hoffman A, et al. Impact of pneumoperitoneum on renal perfusion and excretory function: Beneficial effects of nitroglycerine. Surg Endosc 2009;23:568-76. Liu SY, Leighton T, Davis I, Klein S, Lippmann M, Bongard F, et al. Prospective analysis of cardiopulmonary responses to laparoscopic cholecystectomy. J Laparoendosc Surg 1991;1:241-6. Gerges FJ, Kanazi GE, Jabbour-Khoury SI. Anesthesia for laparoscopy: A review. J Clin Anesth 2006;18:67-78. Juvin P, Marmuse JP, Delerme S, Lecomte P, Mantz J, Demetriou M, et al. Post-operative course after conventional or laparoscopic gastroplasty in morbidly obese patients. Eur J Anaesthesiol 1999;16:400-3. Madsen MR, Jensen KE. Postoperative pain and nausea after laparoscopic cholecystectomy. Surg Laparosc Endosc 1992;2:303-5. Szem JW, Hydo L, Barie PS. A double-blinded evaluation of intraperitoneal bupivacaine vs. saline for the reduction of postoperative pain and nausea after laparoscopic cholecystectomy. Surg Endosc 1996;10:44-8. Imbelloni LE, Fornasari M, Fialho JC, Sant'Anna R, Cordeiro JA. General anesthesia versus spinal anesthesia for laparoscopic cholecystectomy. Rev Bras Anestesiol 2010;60:217-27. Dohi S, Takeshima R, Naito H. Ventilatory and circulatory responses to carbon dioxide and high level sympathectomy induced by epidural blockade in awake humans. Anesth Analg 1986;65:9-14.
van Zundert AA, Stultiens G, Jakimowicz JJ, Peek D, van der Ham WG, Korsten HH, et al. Laparoscopic cholecystectomy under segmental thoracic spinal anaesthesia: A feasibility study. Br J Anaesth 2007;98:682-6. Collins LM, Vaghadia H. Regional anesthesia for laparoscopy. Anesthesiol Clin N Am 2001;19:43-55. Yu G, Wen Q, Qiu L, Bo L, Yu J. Laparoscopic cholecystectomy under spinal anaesthesia vs. general anaesthesia: A meta-analysis of randomized controlled trials. BMC Anesthesiol 2015;15:176. Capelouto CC, Kavoussi LR. Complications of laparoscopic surgery. Urology 1993;42:2-12. Joshi GP. Complications of laparoscopy. Anesthesiol Clin N Am 2001;19:89-105. Henny CP, Hofland J. Laparoscopic surgery: Pitfalls due to anesthesia, positioning, and pneumoperitoneum. Surg Endosc 2005;19:1163-71. Ponsky JL. Complications of laparoscopic cholecystectomy. Am J Surg 1991;161:393-5.